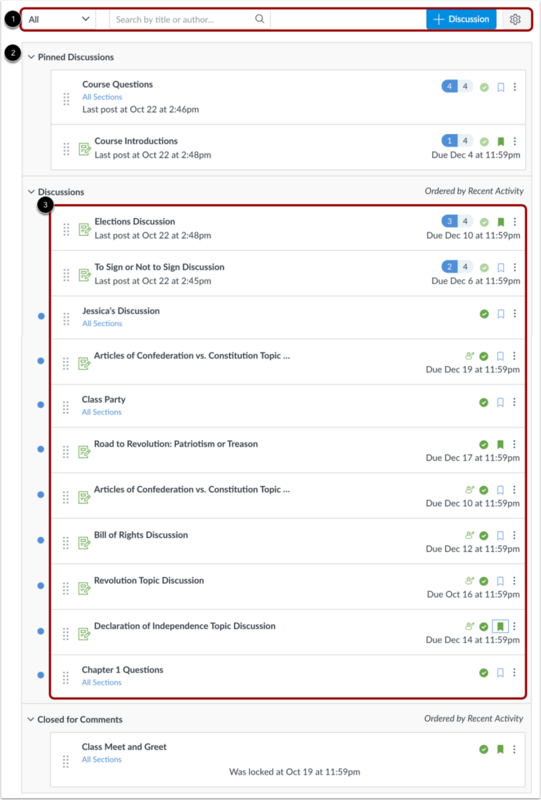 The Discussion Index page allows you to view all the discussions within a course. 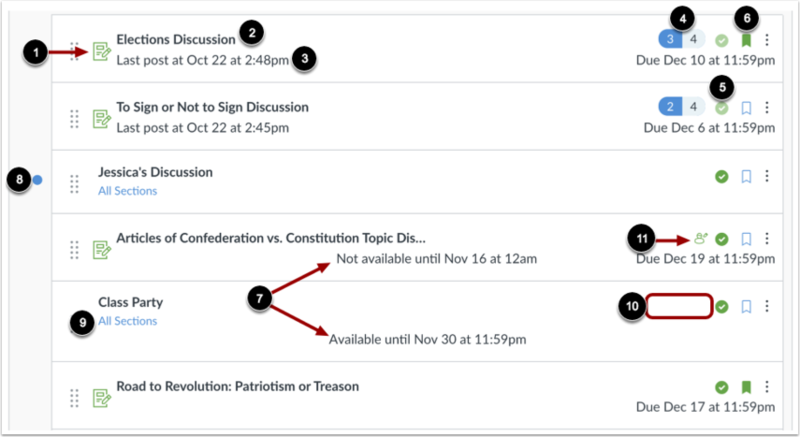 As an instructor, you can add discussions and modify discussion settings. The Discussions Index page is designed with global settings at the top of the page , followed by the Discussion groups . Individual discussions are nested within each Discussion group . Global settings include a drop-down menu to filter all or unread discussions  and a search field for searching discussions . You can also add a new discussion  and edit discussion settings . Discussion groups can be expanded and collapsed by clicking the arrow next to the name. 1. Discussions. These are current discussions within the course. Discussions can remain open indefinitely, or you can specify a date range (as designated by the available from/until date). Discussions with replies are ordered by most recent activity. Discussions with no replies are ordered by creation date. Students will only see this section heading if there are discussions within this section. 2. Pinned Discussions. These are discussions that you want your students to see at the top of their page. Pinned discussions can be arranged in any order. Students will only see this section heading if there are discussions within this section. 3. Closed for Comments. These discussions have been manually closed for comments, or the discussion is past the available from/until date. These are discussions that are only available in a read-only state. Closed for comments discussions are also ordered by most recent activity. Students will always see this section heading, even if there are no discussions within this section. Each discussion displays whether or not it is a graded discussion , the name of the discussion , the date on which the last discussion reply was posted , the number of unread/total posts in the discussion , the discussion state (published or unpublished) , and whether or not you are subscribed to the discussion . You can also view availability dates for graded and ungraded discussions . The unread icon next to a discussion indicates an unread discussion . You can also view which sections are assigned to a discussion . The number of unread/total posts is not included for group discussions and discussions that have no discussion replies . The peer review icon  also displays if a graded discussion has been assigned peer reviews. 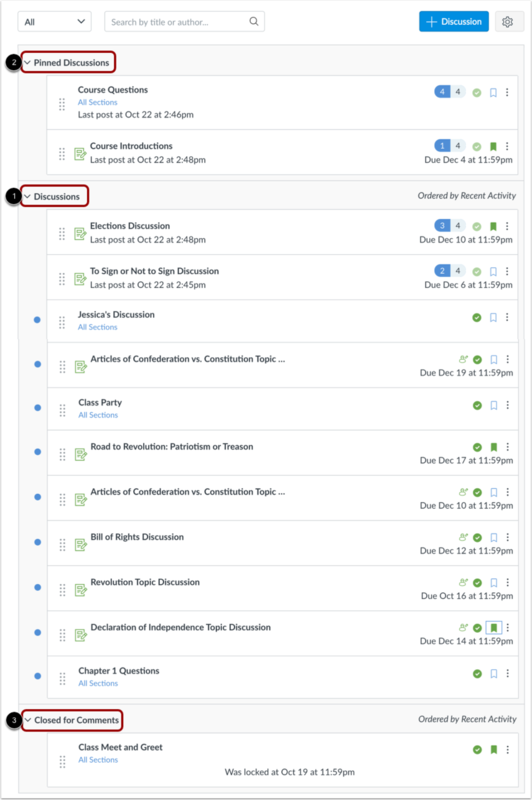 You can also set varied due dates for a discussion and create due dates according to course section. Discussions with varied due dates show the latest due date. Due dates are not required for discussions. Graded discussions with discussion replies cannot be unpublished. This is indicated by the publish icon being lighter in color. Discussions can also include availability dates. Availability dates can make a discussion available for only a specific period of time. 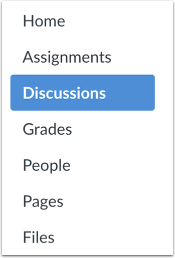 For each individual discussion, you can use the options drop-down menu to close the discussion for comments , pin or unpin the discussion , move the discussion , duplicate the discussion , or delete the discussion . To view discussion details and replies, click the name of the discussion. If you use MasteryPaths in your course, you can tell which items are set up in Modules as MasteryPaths or conditional content items. Previous Topic:How do I view the sync history for a blueprint course as an instructor? Next Topic:How do I create a discussion as an instructor? Table of Contents > Discussions > How do I use the Discussions Index Page? Re: What does the red dot mean?